Alvin DPX Series Deluxe Board With Straightedge 30" X 42"
Alvin Deluxe Boards with Straightedge and VYCO Board Cover: 30\" x 42\", 33 lbs. 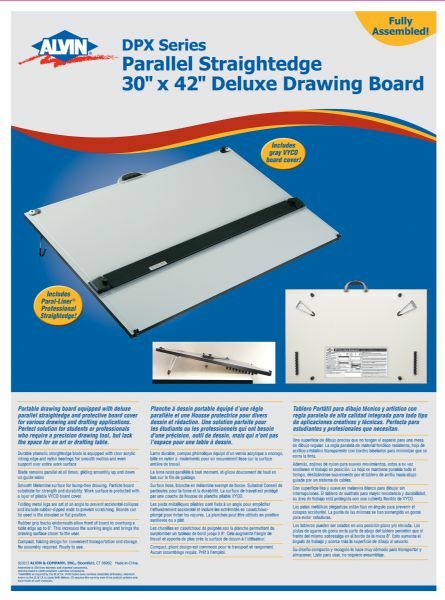 Portable drawing board equipped with deluxe parallel straightedge and protective board cover for various drawing and drafting applications. * Perfect solution for students or professionals who require a precision drawing tool but lack the space for an art or drafting table. * Durable phenolic straightedge blade is equipped with clear acrylic inking edge and nylon bearings for smooth motion and even support over entire work surface. * Blade remains parallel at all times gliding smoothly up and down on guide wires. * Smooth Melamine surface for bump-free drawing. * Particle board substrate for strength and durability. * Work surface is protected with a layer of pliable VYCO board cover. * Folding metal legs are set at an angle to prevent accidental collapse and include rubber-dipped ends to prevent scratching. 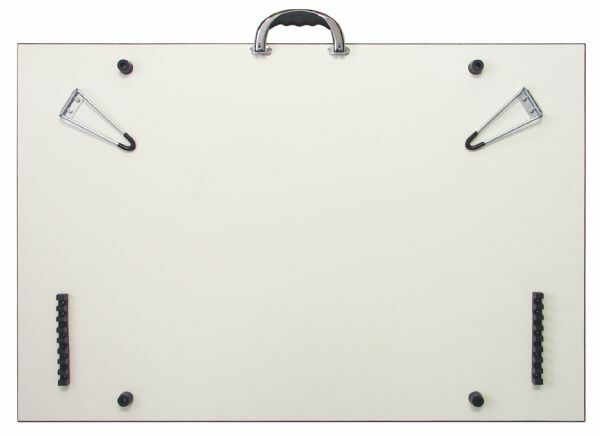 * Board can be used in the elevated or flat position. 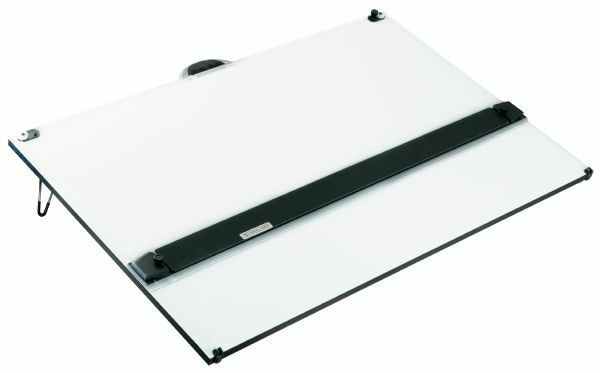 * Rubber grip tracks underneath allow front of board to overhang a table edge up to 8". * This increases the working angle and brings the drawing surface closer to the user. * Compact folding design for convenient transportation and storage. * 30" x 42" board size. The size is 30" x 42". The top material is vinyl. 47" x 35" x 3"
46" x 38" x 4"